The Hyundai Motor Company opened their doors in 1967 as a division of the Hyundai Engineering and Construction Company, which had been in operation since 1947. The founder Chung Ju-Yung thought was wise to diversify and diversify the business for growth worldwide. 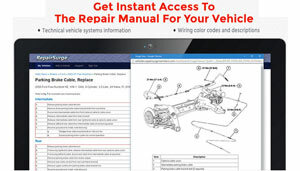 Hyundai brochures or sales catalogs are not easily found until much later for the Hyundai vehicles. The first Hyundai car was released to the market in 1968 was the Cortina, which was in reality a Ford Cortina. Hyundai was determined to create their own cars and in 1974 they hired George Turnbull of Austin Morris and five more British automobile engineers. Then in 1975 Hyundai released a vehicle of their own design called the Pony with a power-train engineered by Mitsubishi Motors in Korea. Sorry, but you wont find any Hyundai brochures or literature of those vehicles here or anywhere that I know of. The Hyundai Pony was exported to several countries including Canada, but not the United States because of emission standards. The Pony was well accepted in Canada and at one pint a top selling car. The Hyundai Motor Company actually reached the one million cars produced mark in 1985 thanks to Canadian sales. Then in 1986 Hyundai started selling cars in the United States. 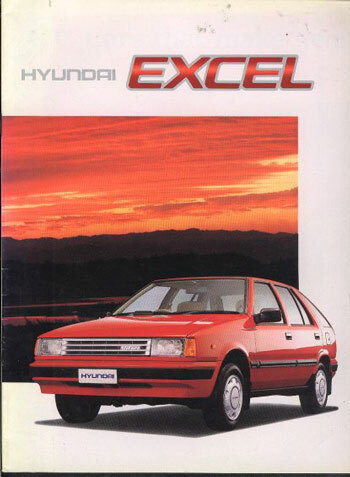 The Hyundai Excel was created for the market and it was actually considered a top ten product for its affordability by Fortune Magazine. Sorry no Hyundai brochures or sales catalogs for that time, but I am sure there must be some around. 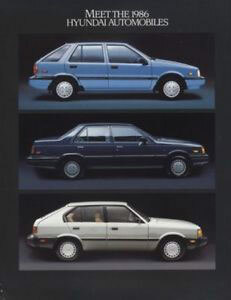 Hyundai started producing cars of their own technology in 1988 by introducing the Sonata, which is still around today. The Hyundai Motor Company hit the 4 million cars produced mark by 1990 and in 1991 the had their own engine and transmission. Hyundai was now an independent automobile manufacturer. Hyundai continued to engineer and invest in their technology and products and introduced the 10 year 100,000 mile warranty on their cars in the United States. In 2004 Hyundai ranked second in initial quality by J.D. Powers and Associates. Take a peek at the Hyundai brochures and literature below for more current offerings by this young automaker.